You’ve found a new place, and it’s official—you’ve moving! It’s an exciting and challenging time, and you’ve got plenty of things to do. The process can seem overwhelming, but it doesn’t have to be that way if you take things a step at a time. It’s time to get organized! Grab a pen and a piece of paper. 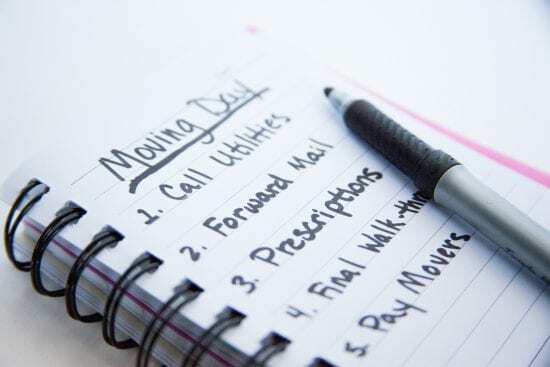 It’s time to create your own moving checklist. This can be as simple or detailed as you’d like, and you can base it on your moving timeline. *Get Organized: Remember all those boxes you have up in the attic and down in the basement? It’s time to do a little unpacking. Sort through and create piles of items to sell, donate or discard. Walk through each room in your house and look for things you don’t need or use anymore. Getting rid of excess stuff will make your move easier! Are the employees full-time workers or contractors? Does the company provide full replacement value insurance? *Pack & Label: If you’re doing the packing, buy supplies like boxes, tape and bubble wrap. Start with items you use infrequently, like a rice cooker or large pots and pans. Carefully label every box so you’ll remember what’s inside. Separate any valuables, like jewelry or old family heirlooms and put them all in once place. *Change Of Address: Fill out a change of address form, either at the post office or online. Talk to one of your neighbors and ask them to collect any magazines or extra pieces of mail that are left behind. *Provide Notifications: Contact your bank, credit card companies, your employer, insurance companies and any other interested parties and give them your new address. *Pack Suitcases: Start to pack daily items, like clothing and toiletries. Use a separate suitcase or overnight bag so you have access to your toothbrush, toiletries and clean clothing. Meet With The Movers: Make final payment arrangements and give them a brief tour of the home so they can take a complete inventory. Take your own copy of the inventory. Final Packing: Gather up any belongings you don’t want in the moving truck and pack everything in your car. Congratulations—you’re ready to go!